Last year began with my usual resolution - No more watches! But it all went down the drain when I discovered Gnomon Watches. Ironically, it sounds almost like my resolution. 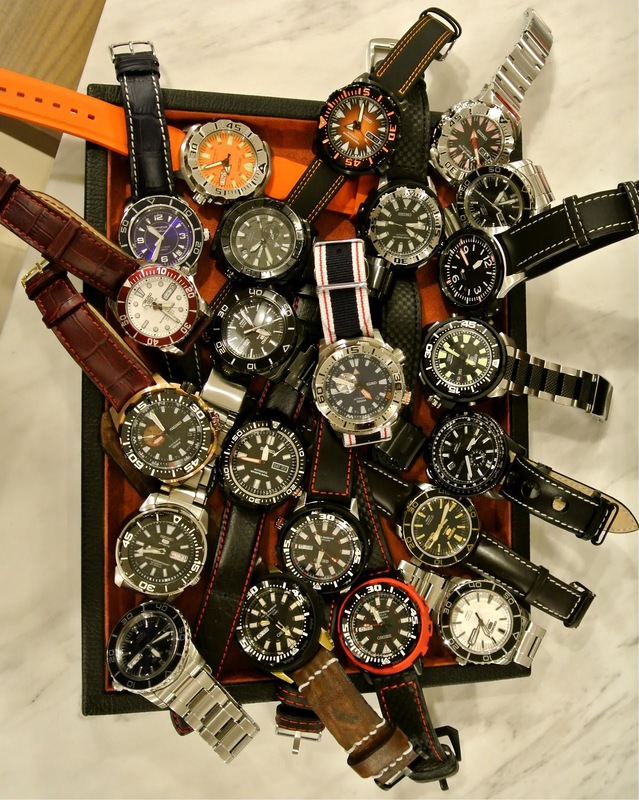 I've always been into watches but I think I might have gone overboard a little. Just a little. My first acquisition began in March when I was holidaying with the family in Hong Kong. It was an unplanned purchase (aren't they all?!) but it was one that I have absolutely no regrets. I went on a hiatus following this purchase. More like a self-imposed exile, really. But three months later, I embarked on another chapter of my watch adventure. My watch salesman introduced me to the world of affordable, reliable, value for money entry level automatics. The build quality of these beauties are remarkable for something that cost a fraction of even some entry level ETA-driven Swiss numbers. I went into a buying frenzy. All those in the pic above were acquired in a 4-month window. The fun was really in the hunt. During the reign of my alter-ego, the Seiko Psycho, I was introduced to numerous forums. These forums were the catalysts that spurred me into the next phase of my journey. My appreciation for affordable, value for money Swiss and German timepieces. I began to compare the quality and prices of some of these pieces against some Swiss offerings using the same generic movements (namely those from the ETA bandwagon). I began to realise that these ETA workhorses have a longer and more remarkable history than some of those newer in-house movements. Furthermore, some of these big Swiss boys are using the same ETA movements in their pieces as well. And they cost a lot more! That was, you might say, a wake up call. I literally went into another frenzy and assembled the above Gnomon Ensemble in a period of 5 months. But apart from Purchasing from Gnomon, I was also on the look out for interesting pieces, particularly divers. These beasts above are some of the pieces that caught my attention. Most are of rather decent value. One of which - the Tudor Black Bay can easily considered my Grail watch for 2012. I'm adamantly sticking by my resolution this year - Gnomon Watches! Oops! I mean NO MORE WATCHES! But truth be told, I've already bout 2 more and one's waiting to be picked up. Resolution out the window again. But seriously, I really do plan to stop soon.